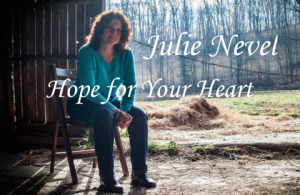 Julie Nevel is an independent contemporary Christian recording artist based in the Harrisburg area of Pennsylvania. A seasoned veteran of 20+ years, Julie has ministered full-time throughout the U.S. and abroad as a worship leader, singer/songwriter, speaker, concert artist and pianist, and more recently has added author to her credentials. *Mark your calendar and save the date. Bring a friend. Or two. Your spirit will be nourished, pampered, uplifted. Great Marriages Don’t Just Happen. 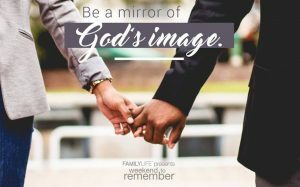 Join FamilyLife for their Weekend to Remember®! 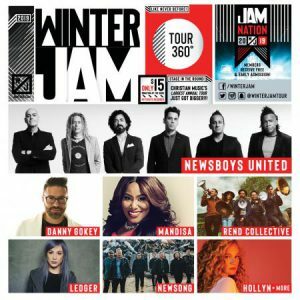 WINTER JAM Returns to Pittsburgh, PA! Plan to enjoy special performances from Newsboys United, Danny Gokey, Mandisa, Rend Collective, Ledger, Newsong, Hollyn & More. Christian Music’s Largest Annual Tour Just Got Bigger! Save the date, and grab a friend: Only $15 at the door. Doors open at 6 PM. 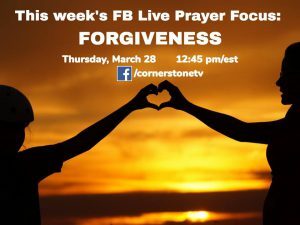 Join us on our Facebook page (facebook.com/CornerstoneTV) as we pray for God to show you the way to forgive those who have wronged you. You can INBOX your prayer requests in advance to our Facebook page. *Your first name may be mentioned as we pray during the Facebook live, unless you make a specific request to remain anonymous. For immediate prayer, you can also call our 24/7 prayer line at 888-665-4483. Love “Sister 2 Sister”? The Sisters are celebrating their 5th Anniversary! Join us for a live taping on April 5th! Episode lengths are approximately 30 minutes with a short break in between and a small reception (with cake!) when the recording is finished. Studio arrival time: 9:45 am. To RSVP: Email s2s@ctvn.org. If you’re bringing guests, please add their names to your RSVP. Thank you! Get ready! Cornerstone Television’s Faith Works 40th Anniversary telethon is just around the corner, and you won’t want to miss this great time of worship, prayer, and people’s lives transformed by amazing miracles from God! Honor God’s faithfulness in miracle after miracle since CTVN’s founding by Russ and Norma Bixler. Renew Cornerstone TV’s commitment to the Gospel calling Russ and Norma received — to “raise My signal to the peoples” (Isaiah 49:22). Proclaim God’s Word clearly — reaching many with the powerful Good News! You’ll discover how you can share the message of God’s love and saving grace through Cornerstone Television. Plus, find out what God really says about miraculous provision — and how to unlock biblical truths to activate your faith. Please tune in, and join us in praying for the Telethon! 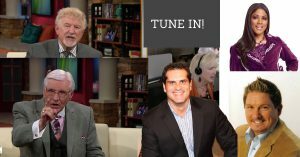 Watch on your local Cornerstone Television Channel or at www.ctvn.org/watch.